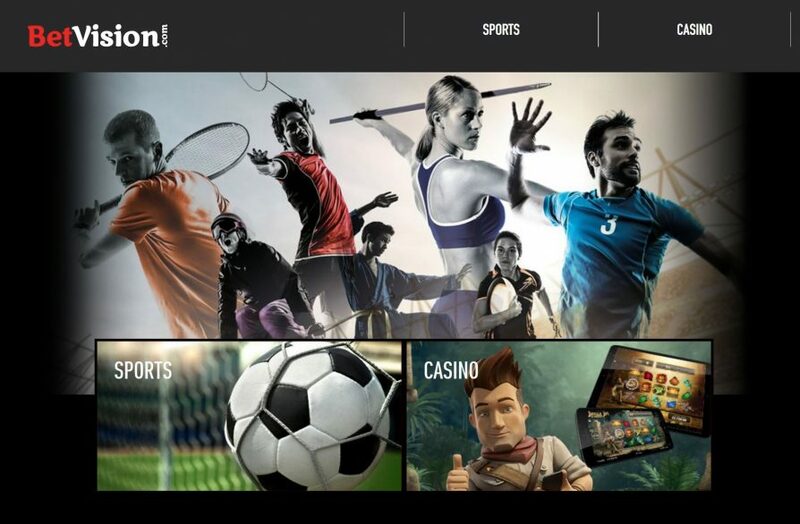 Betvisions’ name might not be something that most players are familiar with but don’t let that deter you as fact is that they are a relatively new online sports betting company that are providing a great product and this is reflected by their huge new following. They were first created back in 2012 and are currently licensed and regulated from UK gambling hub, the Isle of Man. They are fully compliant with all PCI policies and this means that all of their customer’s sensitive data like cards and account details are stored in a secure way, on a server that isn’t attached to their website. Betvision has chosen quite a typical style of layout for their sportsbook, it’s something we are all too familiar with which is a rather good thing because if something isn’t broken, why fix it? Their colour scheme is mainly made up of a black background with a combination of red and white texts, which reflects back to their logo in a positive way. In the top left hand corner of the page you will find a short header that houses their promotions, help, affiliates as well as a login and sign up section. Just below this is where you can see Betvisions’ brand displayed proudly, towards the top left hand corner, on the same line here, you will also be able to select between their sportsbook and casino. Descending downwards on the left hand side of the homepage is a menu that features a quick picks section, this has been designed to allow their customers to save time whilst searching through some of the most popular bets that are being browsed or selected at Betvision. Below is live betting option and further down you will find a complete list of sports that are provided here at Betvision. On the right hand side of the page is where customers will be able to locate their bet slip, this will progressively update as you add bets to it, working out any winnings in the process. Underneath the bet slip is a widget that has a small taste of some of the sports that are currently live and further down is a live schedule, allowing you to keep on top of your favourite games or matches and when they are starting. There is no shortage of sports here at Betvision and they have provided excellent coverage of Football, Tennis, Horse Racing, Winter Sports, Volleyball, Table Tennis, Surfing, Speedway, Specials, Snooker, Pool, Sailing, Rugby Union, Rugby League, Motor Racing, MMA, Ice Hockey, Handball, Futsal, eSports, Darts, Cycling, Cricket, Chess, Boxing, Beach Soccer, Basketball, Baseball, Badminton, Aussie Rules, American Football and Golf. They have gone as far as providing some excellent betting markets for their customers, as well, in fact they sometimes have as many as 120 different football markets for some of the bigger football games. Some of these include Total Goals, 1X2 First Half, Both Teams to Score, 1st to Score, Double Chance, Corners, Draw No Bet, Exact Score, Half-Time/Full-Time, O/U Full-Time, Total Team Goals, Match Winner & Both Teams to Score, Goalscorer markets and a huge amount more. Sadly there aren’t any fixed promotions to be found at Betvision except for their best odds guaranteed on all UK and Irish horse racing. Having spoken to the support team they replied that there wouldn’t be any more promotions added in the near future. This tells us that they are aware of the problem and they should, hopefully, be addressing it when they can. For those of you who like to bet at the most pivotal sporting moments, you’re in luck as Betvision have provided quite a solid in-play console that has been designed in a way that is simple to use and full to the brim of sports and markets, to get stuck into. Sports such as Golf, Cricket, Football, Tennis, Baseball, Basketball, Handball, Table Tennis, Volleyball, Ice Hockey, Handball and Rugby League are all covered extensively. Their in-play markets are also quite up to scratch and they provide a wealth of different markets, even for some of the smaller games that you wouldn’t expect to find. For in-play football, you can expect to see the likes of 1X2, 1st to Score, Total Goals O/U, Both Teams to Score, Double Chance, Corners O/U, Draw No Bet, Asian Handicap, O/U, Total Team Goals, Exact Score, Half-Time/Full-Time, Corners, Number of Goals, Clean Sheet, Last to Score, Teams to Score in Both Halves, 1st/2nd Half Odd/Even and many more. Unfortunately you won’t find a dedicated mobile application here at Betvision, which is a shame as this is something we are now starting to take for granted and is becoming more and more the norm with bookies, these days. They have, however, optimised their website to fit a smaller screen, so don’t let that deter you from visiting their sportsbook from your mobile or tablet because everything that can be found and accessed from the desktop version can still be enjoyed from your portable device. For an online sports betting site that hasn’t had as much of the limelight as some of the bigger names, we feel they have done a good job at providing a mix of different payment methods. Customers can use e-wallets like Neteller and Skrill to add and withdraw funds from their accounts as well as cards like Visa and MasterCard. Withdrawal times vary depending on which method you choose, e-wallets are generally faster and can be as fast as 24 hours. Cards taking slightly longer, between 3 and 5 business days before you receive your winnings. There is good news and this comes in the form of their 24 hour a day, 7 days a week customer support operation times, this means that if you are usually a night owl when it comes to your hours of play, you are still able to get quality help no matter what the time is. The best way to get in touch would be via their live chat function but there is also an email address listed on the website, which they respond to. Overall, a really good effort from Betvision but they do let themselves down in some areas. Their range of sports and betting markets is a pleasant sight and even their in-play console holds its own as being one of the better ones out there. They are somewhat let down, though, by their lack of ongoing customer promotions and mobile betting console, which is a shame because the rest of their sportsbook is a pleasureful experience to use. If you would like to see exactly what’s in store for you with a Betvision account, click below to sign up and start one today.